Yuzo Kayama is to Japan what Nokie Edwards is to America. He has his own signature model Mosrite in Japan. 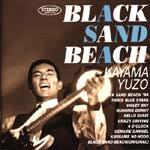 Except for "Black Sand Beach '94," this is a compilation of his work with his mid sixties band Kayama Yuzo and the Launchers," culled from their three 1966-67 albums. The liner notes include sheet music. This updating of "Black Sand Beach" sports really nice surf chunk rhythm guitar, and stunning lead work. The melody is fluid and the playing exceptional. The drums are a definite part of the track's magnetism, offsetting the band with interesting patterns. "Three Blue Stars" is melodic and fluid. Its melody line is semi familiar, especially during the breaks when it drops into a variation of "Let's Go." Using a rhythm pattern like "Shakin' All Over," "Violet Sky" gradually builds to an oriental theme with exquisite whammy and a colorful feel. This moderately paced track sticks with you. The Ventures influence is clear, but so are the original ideas and carefully crafted recording. Some double picking and some cowboy shouts together in this surf stomp and mechanical bull ride masterpiece. Very fun. This smooth samba tune displays just how well Kayama Yuzo can play his ax, and just how versatile he is. A snappy groove in a west coast jazz jacket. Chunky churning power train rock for the track. Pounding drums, chunky rhythm guitar chops, and a spiffy little riff. You can almost see Eddy Angel doing this one. With tone and structure hinting at the Searchers' version of Jackie DeShannon's "Needle and Pins," "4 O'clock" takes dead aim at gettin' off work, with an eye on a night out. Fun and flirtatious. Floaty whimsical and very melodic, this fine instro lays bare images of flirtatious breezy afternoon encounters on the beach. Very pretty. "Kirisami No Hodo" has a sorta little grass shack backing, with a playful lead and a light over all feel. Pretty far afield from surf, but a darn nice track. This is the original version of "Black Sand Beach." This is a spectacularly good track with intense rhythm and guitar tone. For my money, it epitomizes eleki! Recorded in late '65, issued in '66.